RoMa is a stunning new luxury superyacht built by Viareggio SuperYachts. Launched in 2009, she has an extremely spacious interior and a sleek exterior styled by Espen Oeino. She can accommodate 12 guests in six staterooms, all with ensuite facilities, and the full-width master stateroom on the main deck offers incredible panoramic views. She has a number of extra features including a gym, a cinema/games room and an extremely large pool and Jacuzzi. 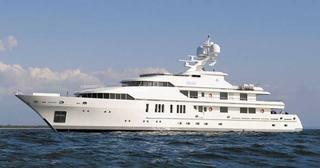 RoMa will be available for charter in the Indian Ocean following the show and is currently for sale at €59.5 million.